Bathymetric maps are a type of contour map that shows the difference in elevation in the sea floor. 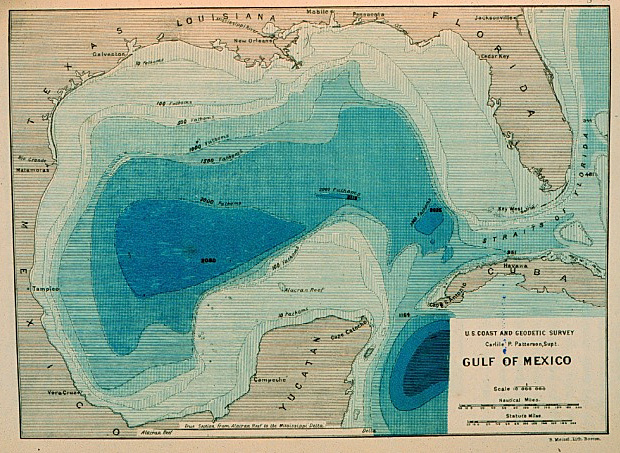 This map shows the difference in elevation in the Gulf of Mexico. The different colors within the ocean represent the different depths. This map shows that the water that is closer to the shore lines isn’t as deep as it is when it’s further from land. This map shows that the water north of Cuba is more shallow than the water south of Cuba. It is easy to see the different depths by the colors of the water.